Hello Again!!!! I am soooo excited to be participating in the Little Kiwis Closet blog hop! I test for the amazingly wonderful and talented Lydia often but I did not get to test this gorgeous dress. So when she was looking for people to participate in a blog hop I jumped at the chance. 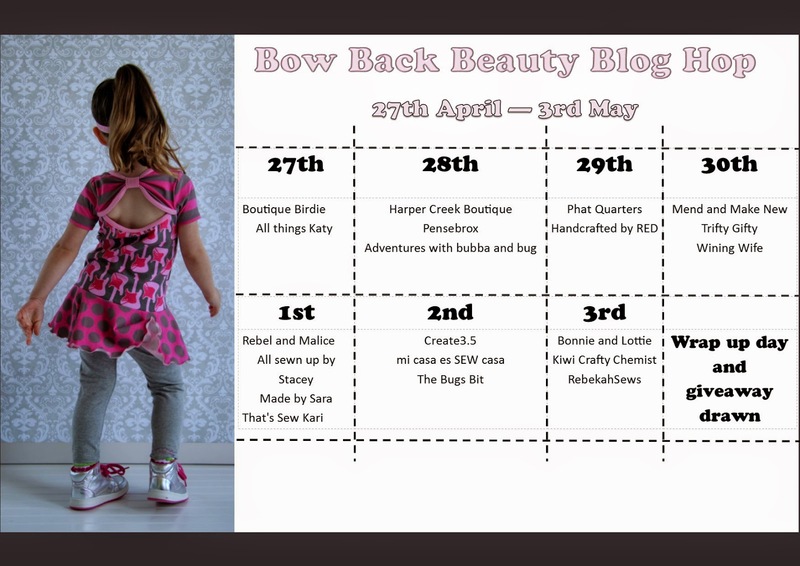 Officially welcome to the BOW BACK BEAUTY BLOG HOP! If this is your first time seeing my blog: Welcome! I am glad to have you. Feel free to look around! I sew for my two children and mainly for my daughter who is fashion minded and has a unique style of her own. Sizes: nb-12 years, so basically everyone! Fabric: This is a great time to use those yummy knit fabrics you have been stashing. So how did I choose with so many options? Well, I asked the diva of course! She is in love with length on her dresses so she chose the high low option with the bow back. And told me to surprise her with fabrics.... I think I chose well! I left the bottom unhemmed to give her a little bit of extra length which made for a very happy little girl. The top is a shiny spandex that she loved and gives her a little sparkle. 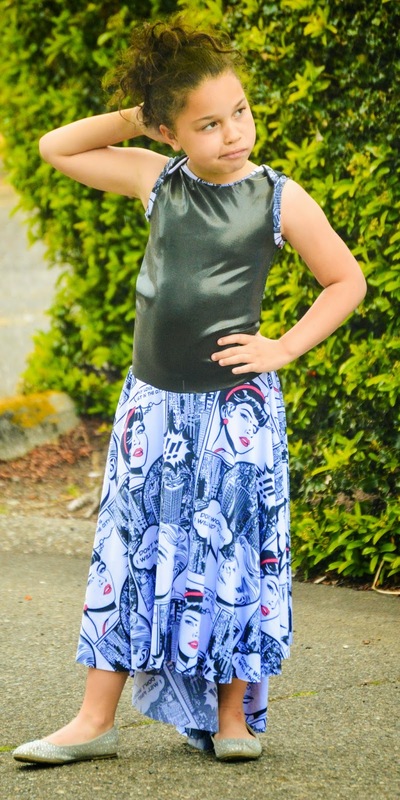 The skirt fabric was directional and the pattern gives great instructions for using this type of fabric. The binding on the bow creates a beautiful look that calls attention to the back and wraps around for a full coverage look. The instructions are very clear and easy to follow. So head over to get your copy of the Bow Back Beauty and make your own! I know I will be trying the other options very soon. Leave me a comment letting me know what option you would choose! But wait before you leave... enter the rafflecopter to win one! And head over to the blog and see my fellow blog hoppers creations! Spring Summer Collection by Gracious Threads!